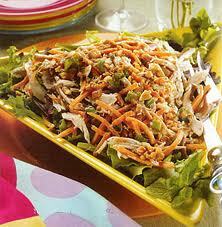 Chinese Chicken Salad, California Cuisine! I do live in Los Angeles. I know a lot of my recent posts have been New England oriented, but for a while now, Socal is where I call home. Considering it is still VERY HOT and DRY in LA, I feel it appropriate to add something that is somewhat ‘California’ cuisine, and not too heavy or hot. No firing up ovens. California cuisine is of course a mix of traditional American, Mexican and Asian, with a very light and flavorful flare. We try not to use a lot of oils and fats; we try to use reductions and lighter preparations. The food is still incredible, when done right. This recipe, a classic in its own right, it made in ‘California’ tradition, ie light, healthy, flavorful, diverse and depends on very little fat, sugar, or ‘heavy’ ingredients. My girlfriend loves this salad and this post will be a shout-out in her direction! Meghan, for you! I love cooking like this! This is the kind of cooking I do for myself on a regular basis (like Tabouleh http://chefnotebook.blogspot.com/2012/08/tabouleh.html) and hope you will also embrace the natural, healthy and incredible flavors! I am breaking this recipe down into a few steps, to make it less complicated and to allow you to budget your time. You will need to make one salad, one vinaigrette, prepare a chicken rub, and prep/grill chicken. It’s no more work than any other dinner, and I want to present this as simply as possible! Reduce the orange juice until it is thick. Let cool completely. In a bar blender, add the shallot, ginger and garlic with the orange juice, honey, soy sauce and rice wine vinegar. With the machine running, slowly drizzle the oil, little at a time, until slightly thick. Add salt and pepper. If too sweet, add a touch more vinegar, if not sweet enough, add a touch of oil. If too sweet and too acidic, emulsify more oil to cut it. Reserve. Mix all ingredients together. Seal in an air-tight container until ready to use. Cut the chicken breasts in half and pound thin. Sprinkle with rub, lightly salt and grill over high heat, quickly, until cooked. Let rest 2 minutes, and slice thin. Reserve. Place all salad items in a mixing bowl. Season with salt and pepper and lightly toss with vinaigrette. Mound in the center of a shallow platter. Put the chicken in the mixing bowl, add a little more vinaigrette and toss to coat evenly. Mound the chicken on top of the greens. Top with fried wontons or noodles. That’s it! No critical after thoughts! Personally, I might throw a little cucumber, avocado and cilantro in, but that might change the nature of the salad (it would still be delicious though). Thank you for my shout-out! I had Chinese Chicken Salad for lunch today…and it was NOT as good as this version, I promise.